Suppose you are offered an investment that will make three $10,000 payments in the future (thus generating future cash flows). The first payment will occur four years from today. The second will occur five years from today and the third payment will occur in six years. If you can earn 13% on other investments, what is the most you would be willing to pay for this investment now? In other words, what is the future value of the cash flows today? Note: We will use the future value discount factor to come up with the answers. This tells us that the future value of these cash flows, at 13% rate of return is $34,069. Notice how the funds will have grown from 3 rounds of $10,000 contributions totalling $30,000 to $34,069. Thus, what is the investment gain achieved? This tell us that in order to buy this investment, the most you would be willing to pay for this investment right now (present value) is $16,379.33 assuming a rate of return of 13%. 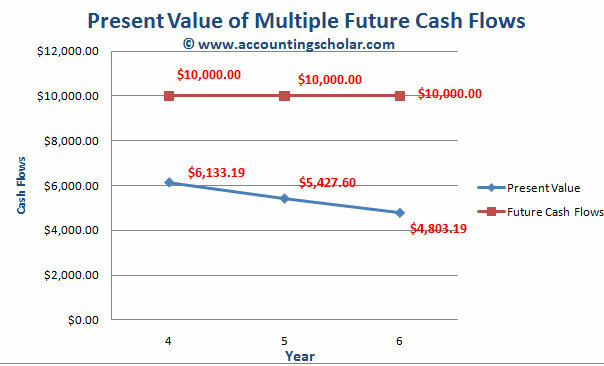 Alternatively, we could calculate the present value by looking at the cash flows one at a time. This graph above shows the present value of the annual $10,000 contributions each year and tells us the present value is $6,133.19 in Year 4, $5,427.60 in Year 5 and $4,803.19 in Year 6. Notice as the years get older, the present value tends to get smaller.